therepubliq and Austin Tour Company present the 4th annual BIG GAY RIVER FLOAT on SUNDAY, JUNE 2, 2019. Just like last year, there are two options. The first option is for those who want to ride the bus from Austin. It includes transportation to and from the float as well as all tube rentals. The second option is for those who want to drive their own vehicle. It includes tube rentals and a shuttle back to your vehicle. If you want to take part in the float but don’t need the transportation or tube rentals, you are welcome to join us, but note that the outfitter does charge walk-up fees. The float is 2 1/4 miles and lasts about 3 – 3 1/2 hours. The full trip will total approximately 5 – 5 1/2 hours. NOTE: Float time will vary depending on the speed of the river which will vary depending on recent rains. We’re meeting up on SUNDAY, JUNE 2, 2019 down on 4th Street at Oilcan Harry’s. Registration will be open from 12 NOON to 1 PM. Buses will depart as they fill, with last bus leaving at 1:15 PM. It’s BYOB so bring what you want to drink … EXCEPT, NO GLASS OR STYROFOAM, these are banned on the San Marcos River. We’ll provide tubes, coolers, cooler tubes and ice. Tickets are $65 and include transportation to and from San Marcos. If you don’t need transportation between Austin and San Marcos (you’re opting to drive your own vehicle down, you’re from the surrounding, or maybe you’re coming in from out-of-town someplace south of Austin, e.g., San Antonio, Corpus Christi), we do have a “no-bus” option for $35 that includes the tube rental and shuttle back to your vehicle. 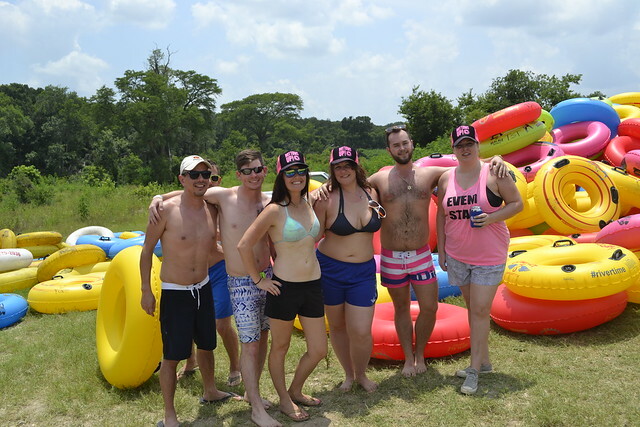 If you’re meeting us there … either you chose option #2 or you’re bringing your own tubes … we’re dropping it at Texas State Tubes Park & Float location at 2024 North Old Bastrop Rd., San Marcos, TX 78666. This is where you will need to check-in if you’ve got the Option #2 package. There is a shuttle at the end of the float that brings you back to your vehicle at this point. Unfortunately the address doesn’t show up correctly online so we’ve pinned the actual location on the map below. After the float, the buses will drop floaters off at Rain on 4th for our official Austin after party featuring tunes by DJ Kahlu. PLUS, your float wristband gets you discounted prices on regular priced drinks through Sunday Funday happy hour. Want to become a partner for the 2019 float? Email Chase Martin at chase@therepubliq.com about becoming a sponsor or promotional partner for an upcoming event.